St. Xavier University, Chicago, Ill.
Open to all members. Please send a short biography (maximum 250 words) to John Fraim and a JPEG photo (if you want a photo included). Relevant Bio information is: birth place, education, former professions, interests or hobbies, screenplays written, other written and published works, awards or contests won. 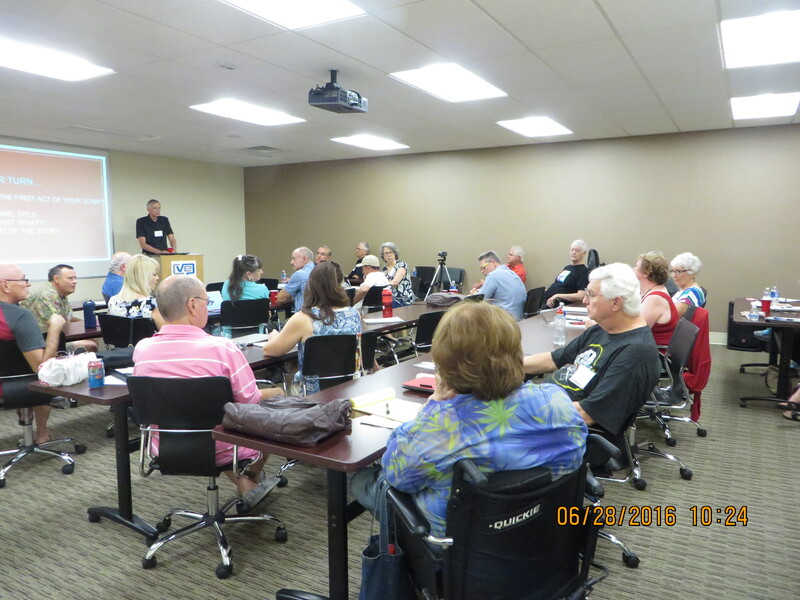 Well-known screenwriter Jurgen Wolff talk on 6/28 had a record attendance! 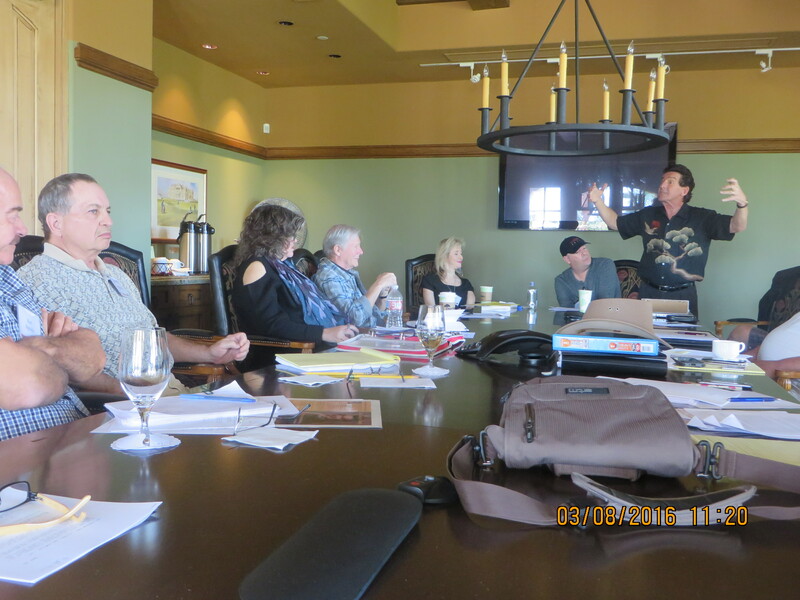 The 6/20 table read meeting of Dennis Simpson’s screenplay. The 4/12 meeting. Logline reviews and ten page read. Don Hofmeister standing was his 5 page read. 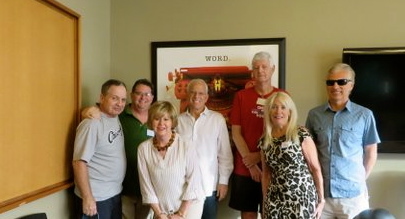 Our guests included singer Michael Dees, actor Michael Dante and Producer Neal Turnage. The 3/22 meeting. 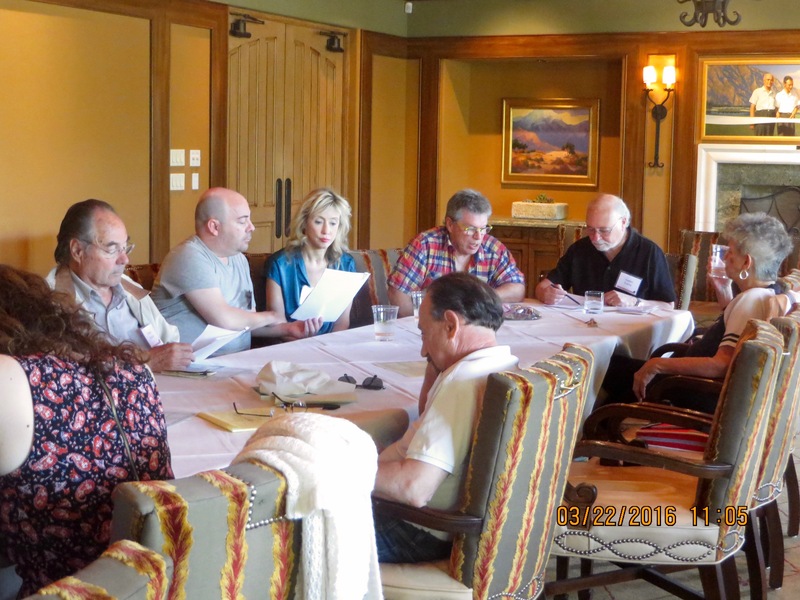 Members participating in table read of first 10 pages of a Mike Colonna script. 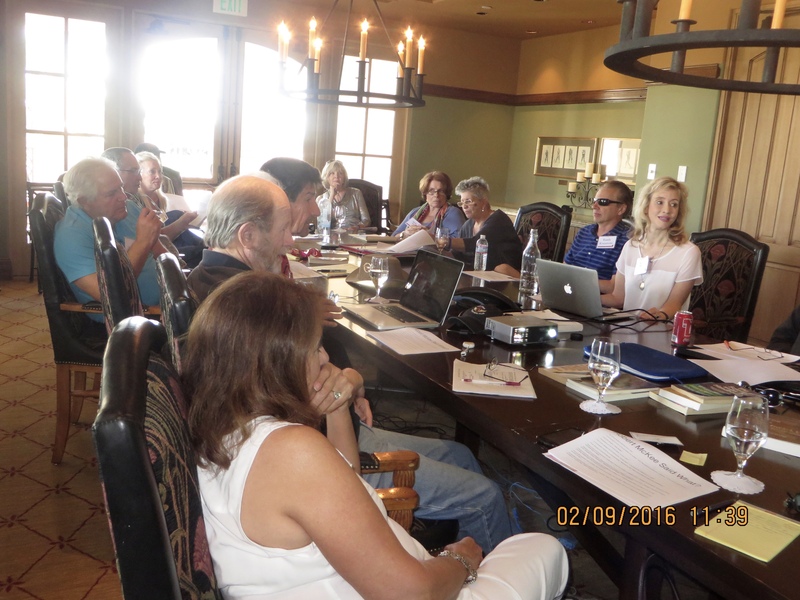 The 3/8 meeting on the topic “Action speaks louder than words. Each character needs his/her voice.” Presenters in middle of the photo are Kristin Johnson, Phillip Vance and John Burns (standing). 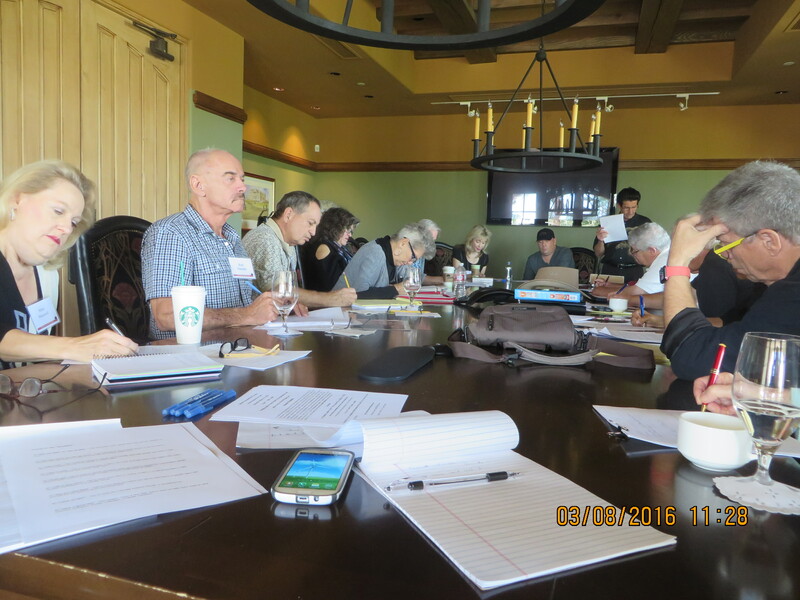 Everyone working on assignment from John Burns in the 3/8 meeting. 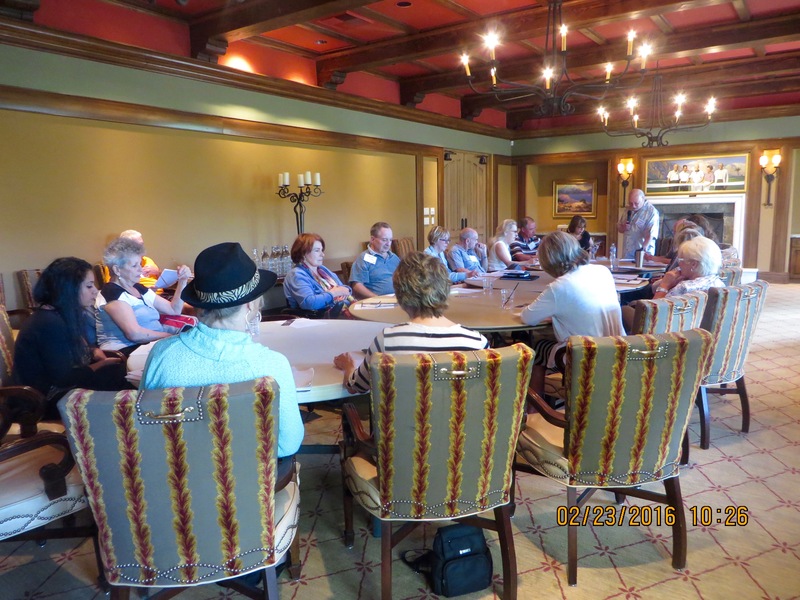 The 2/23/16 meeting featuring our Creative Advisor Andrew Kaplan. 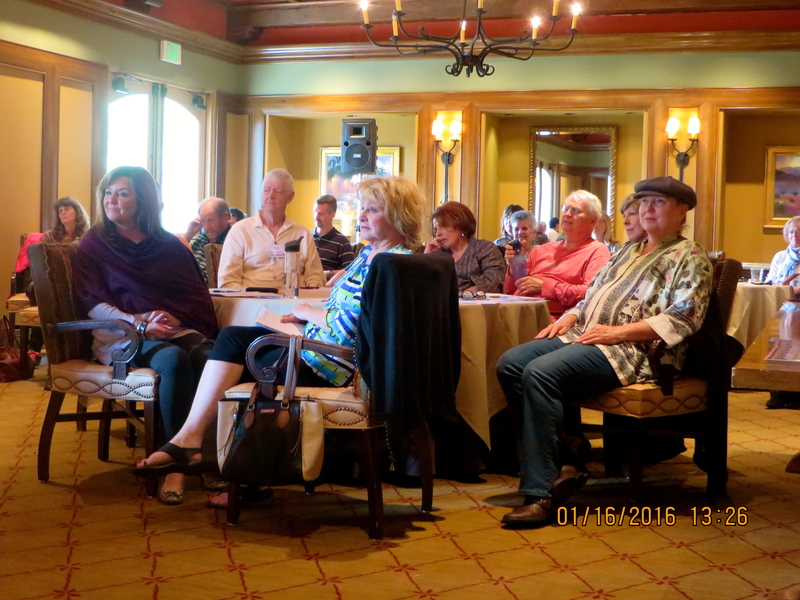 The 2/23/16 meeting was one of our largest yet with people coming from San Diego and LA. 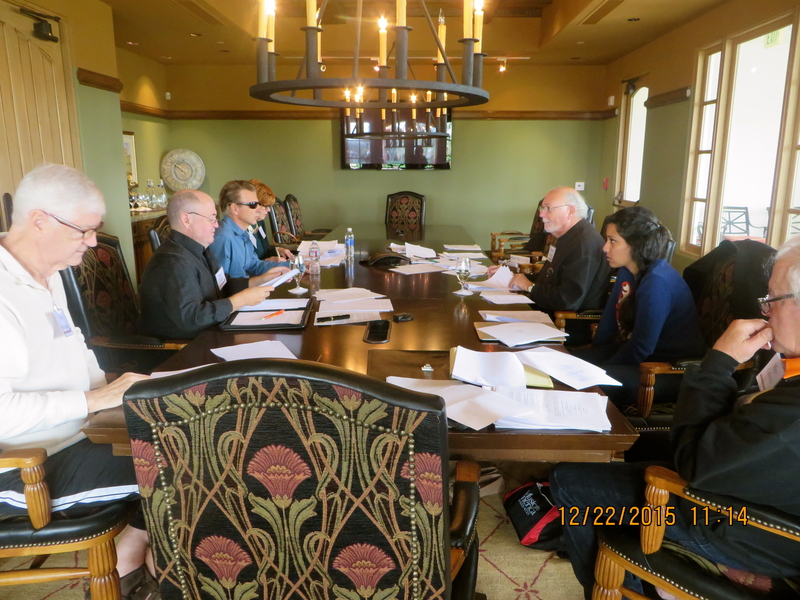 Author and DSG member Kristin Johnson (white dress in center) presents to the DSG 2/9/16 meeting on dialogue. 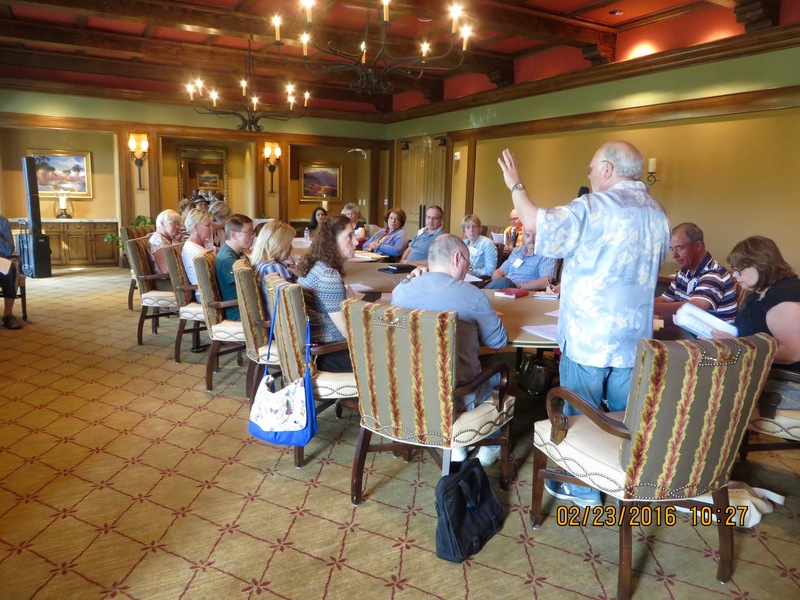 According to member feedback, one of our best meetings. 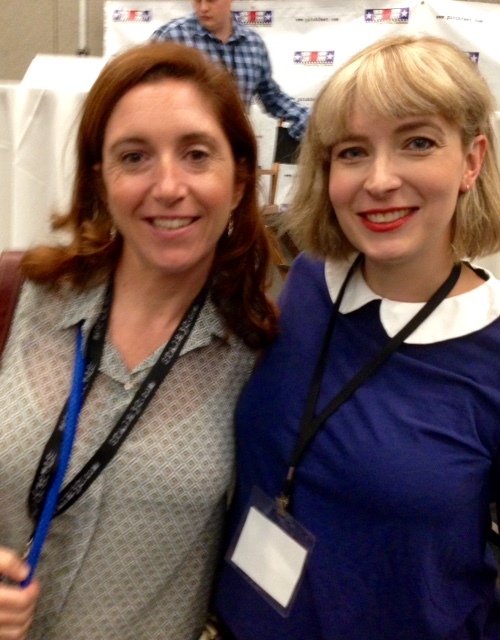 Thanks much Kristin, Janeil and Mike for making this all possible! 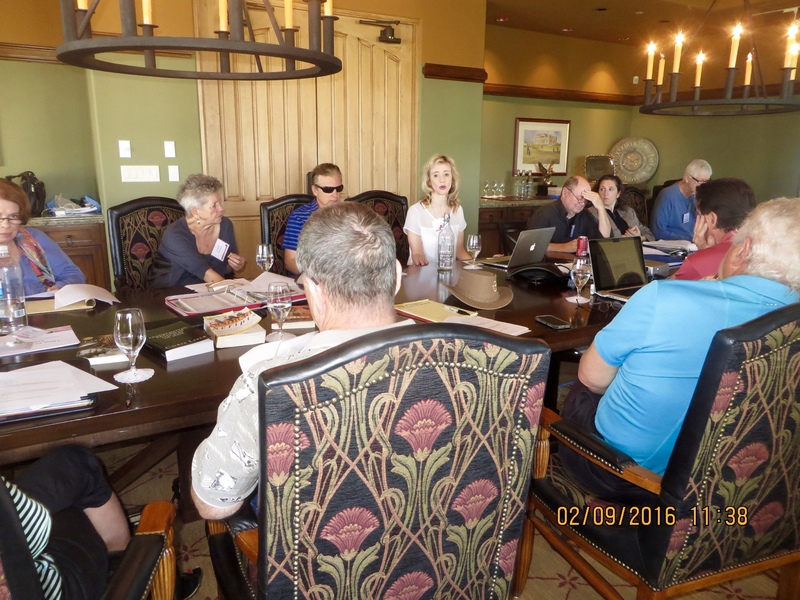 Another photo of the 2/9/17 Kristin Johnson meeting on dialogue. Mike Colonna makes a point at the 2/9/16 meeting as John Burns looks on. 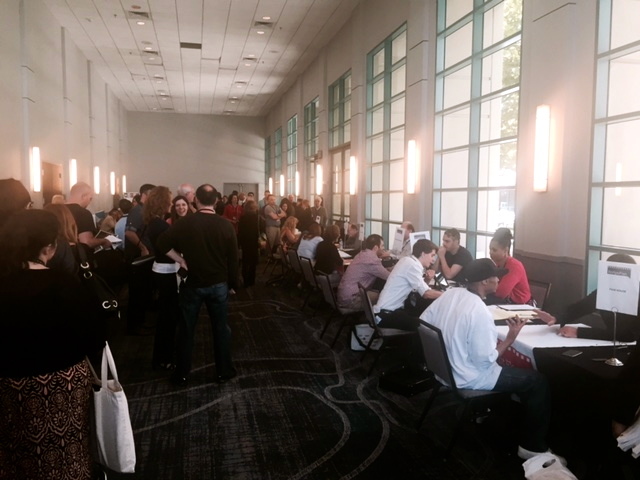 The DSG starts 2016 with it’s largest meeting in its history! 40 come to hear the fantastic presentation about selling to Hollywood by NYT best-selling author and DSG Creative Advisor Andrew Kaplan. DSG Creative Advisor talks at the 1/16/16 event. 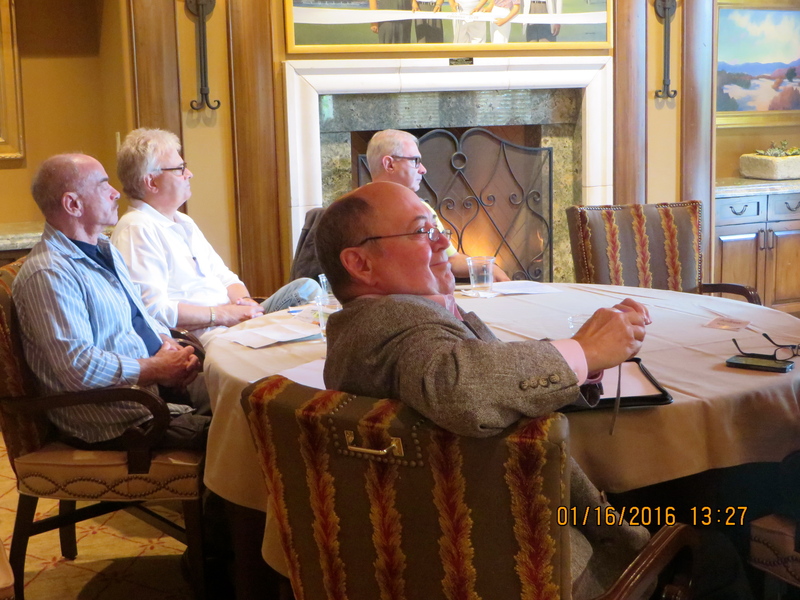 DSG President Ray Lovato listens to the Kaplan presentation at the 1/16/16 event. 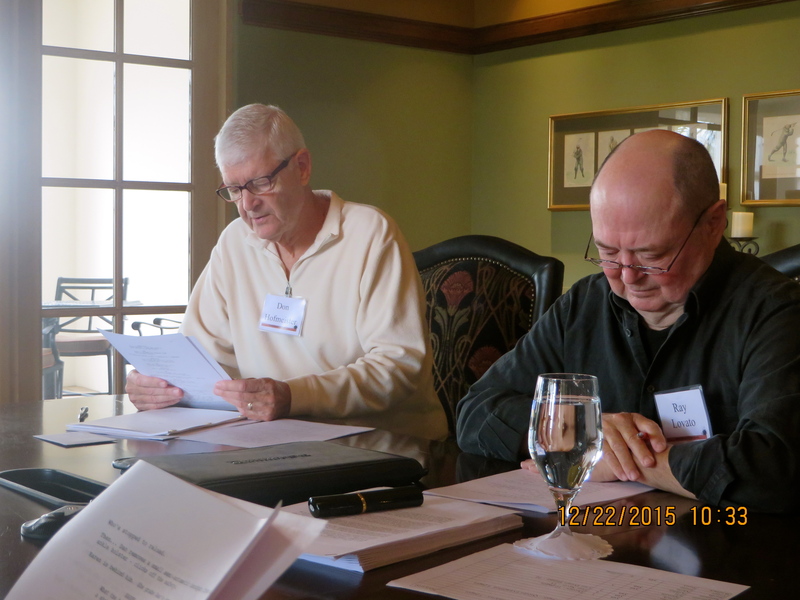 Don Hofmeister and Ray Lovato study a script problem at the 12/22/15 meeting. 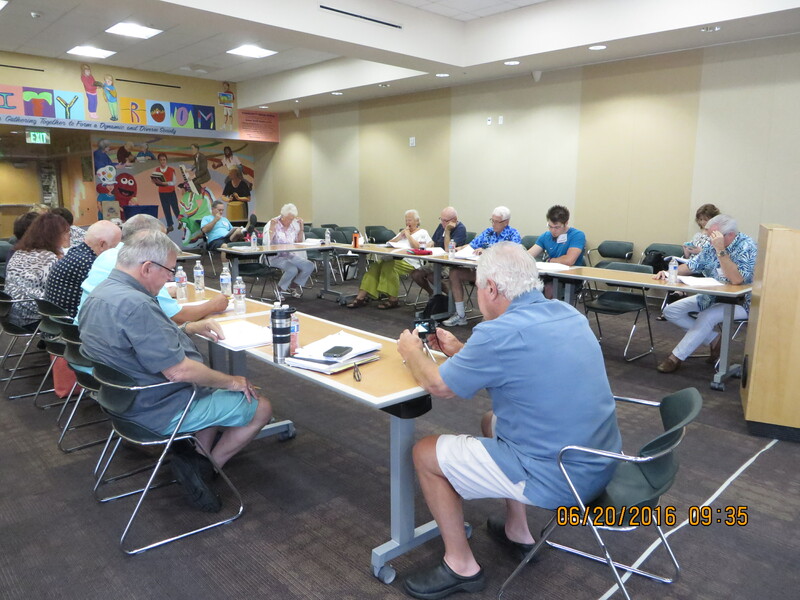 PSWG meeting 12/6/15. 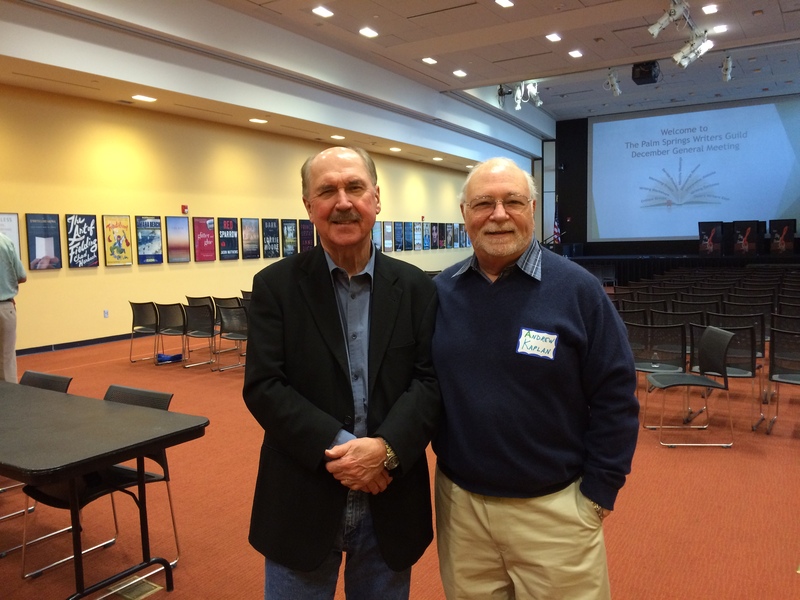 DSG member Andrew Kaplan (on right) with bestselling author David Morrell. 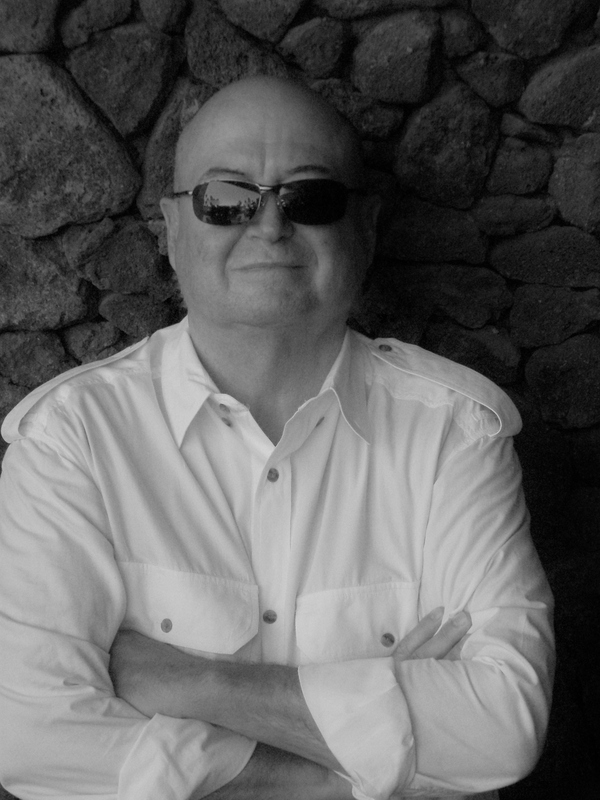 He is best known for his debut 1972 novel First Blood, which would later become the successful Rambo film franchise starring Sylvester Stallone. 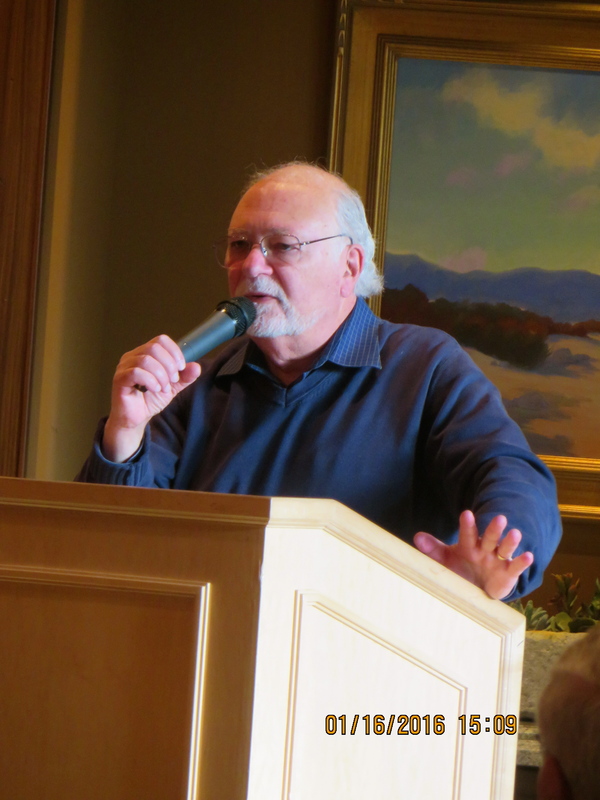 He has written 28 novels, and his work has been translated into 26 languages. 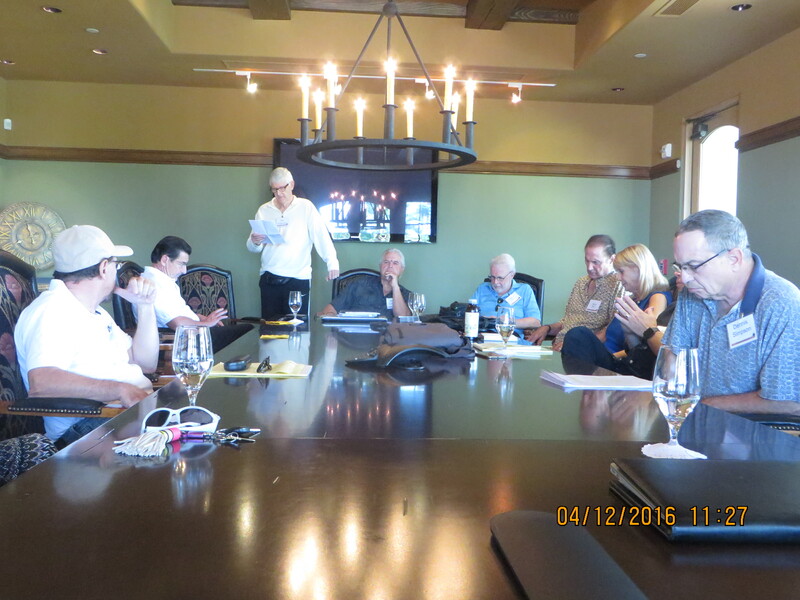 The 11/10/15 meeting featuring world famous screenwriter Jurgen Wolff in the new meeting room for the DSG … the boardroom of the La Quinta CC. Much thanks to DSG member and La Quinta CC member Mike Colonna for making this happen. 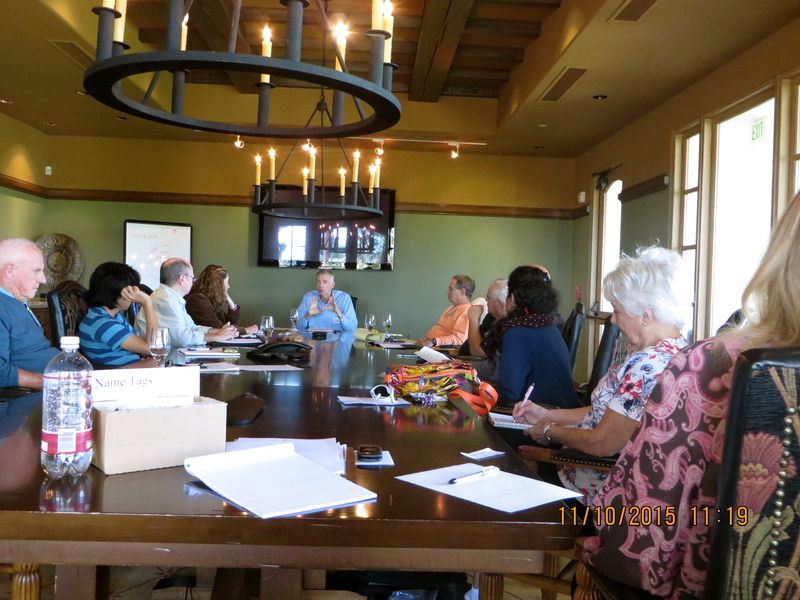 The 10/23/15 Logline Meeting of the DSG: Much great discussion. 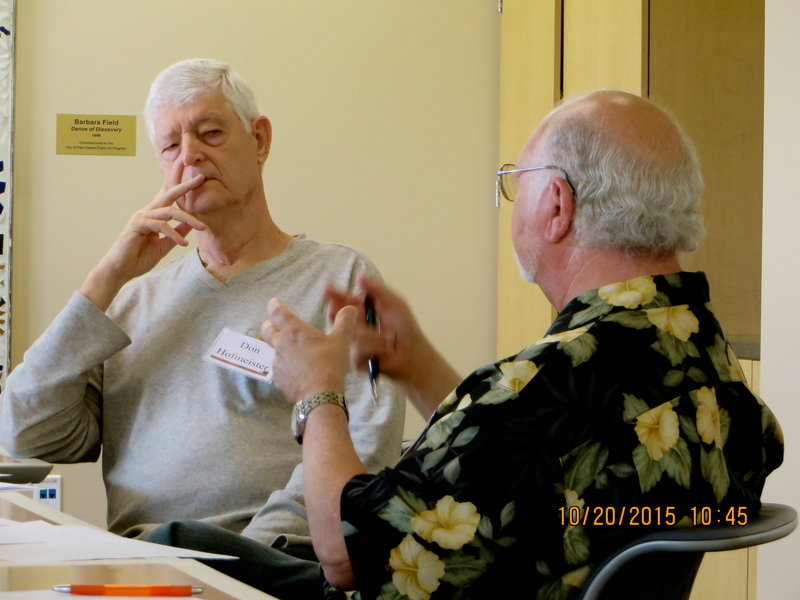 Andy Harmon (left) of CV Rep Theatre makes a point. 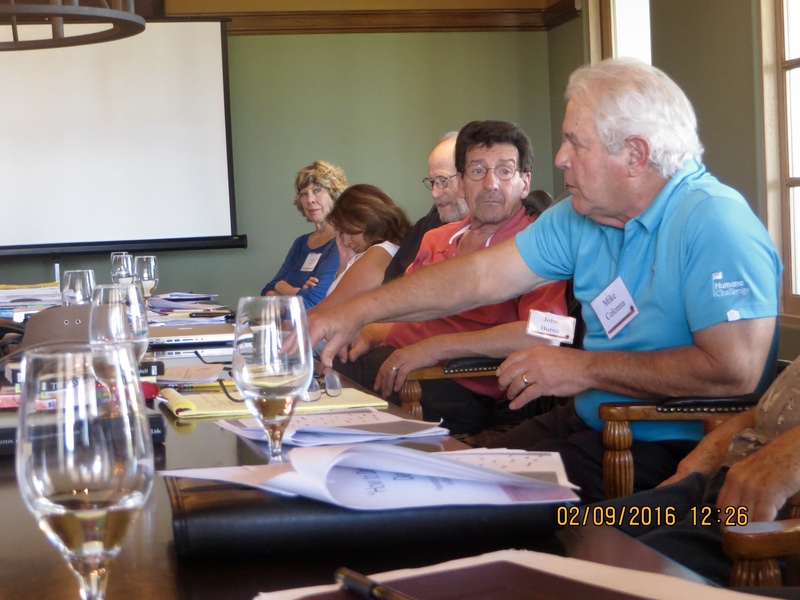 Next to him to his left, Mike Colonna, Tom McKeown, John Burns, Dwayne Frechette (hidden) and Dennis Simpson listen. 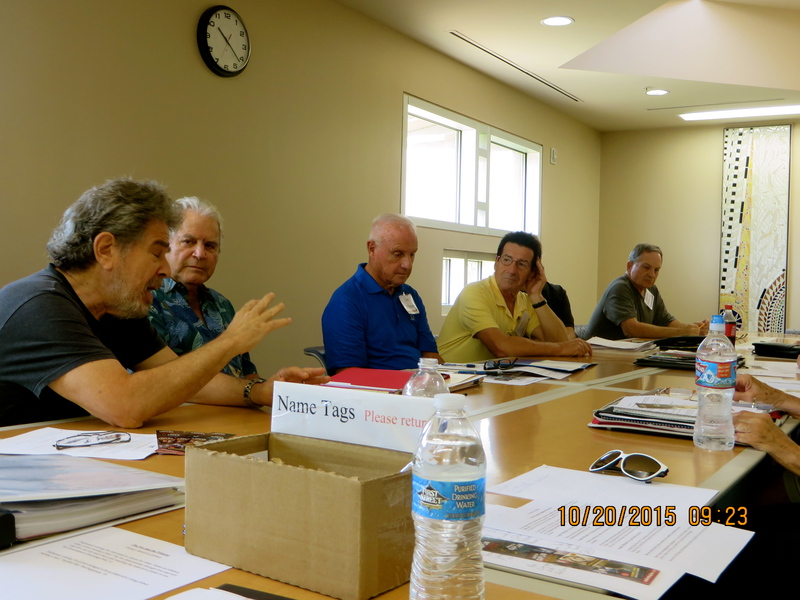 Group meeting leader Andrew Kaplan (in black shirt) next to DWG President Ray Lovato (middle) and Patrick Bonomo at the 10/23/15 meeting. 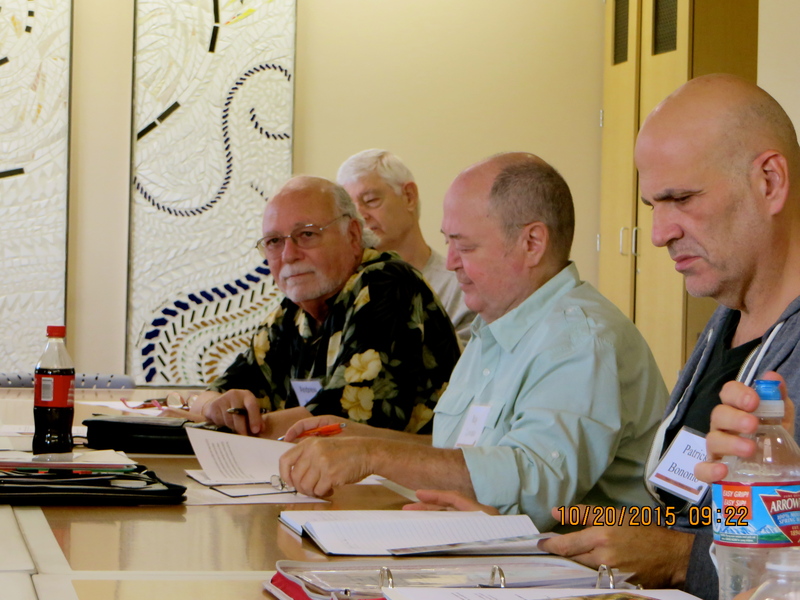 Don Hofmeister gives Andrew Kaplan his traditional skeptical look at the loglines meeting in October 2015. 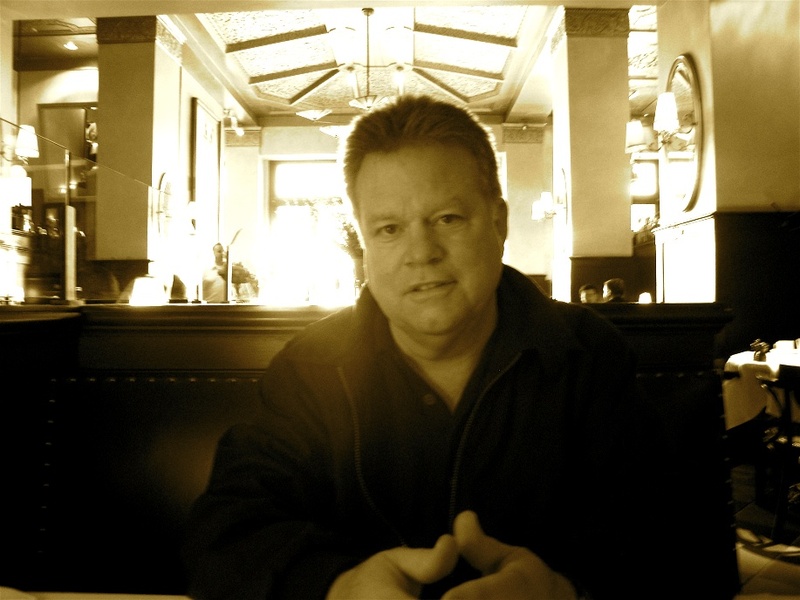 Don has written more screenplays than any member of DSW.